Greetings from zip code 99747 in Kaktovik, Alaska! Kaktovik lies on the far northeast coast of Alaska above the Arctic Circle and in the Arctic National Wildlife Refuge (ANWR). It is a whaling community with a long history of its people living in close proximity to polar bears. I traveled to Kaktovik in 2014 and again in 2015. This time I am fortunate to be joined by one of the Detroit Zoological Society’s (DZS) associate mammal curators, Betsie Meister, who has extensive experience with polar bears and oversees the Arctic Ring of Life, an expansive 4-acre habitat at the Detroit Zoo that is home to polar bears, seals and arctic foxes. We are here to help colleagues with U.S. Geological Survey, U.S. 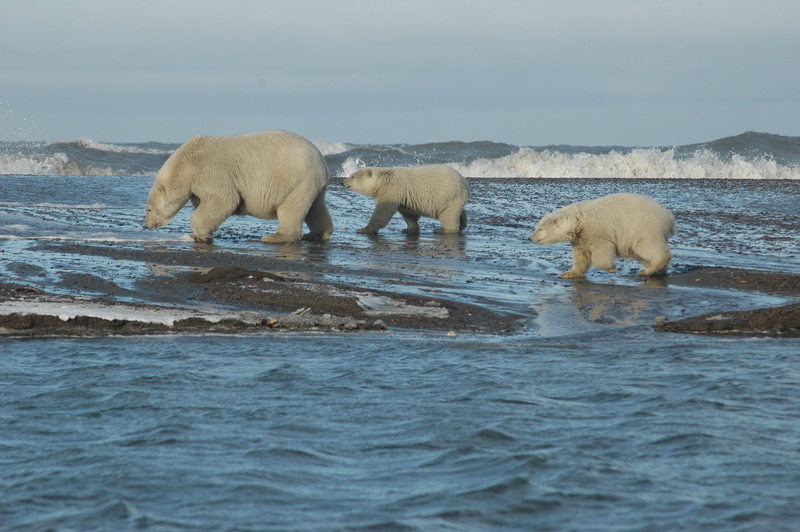 Fish and Wildlife Service and ANWR to study changes in polar bear numbers, as well as polar bear behavior and use of resources in response to the changing climate. As the climate warms, the arctic summer is getting longer and sea ice is diminishing. Polar bears come off the sea ice usually in late August and spend September and a few weeks of October in the area around Kaktovik waiting for the sea ice to form again. Polar bears use the sea ice as their platform for hunting seals, which is the majority of their wild diet. Without access to the ice, the bears are forced to spend more time on land. The Inupiat community of Kaktovik hunt bowhead whales every fall to store enough food for the winter. After processing the whales on the beach, the whale remains are taken about a mile and half to the edge of town and placed in the “bone pile”. Polar bears come to feast on the remains, which continue to be a strong attractant for weeks. Kaktovik, which is home to approximately 300 people year round, adds a population of polar bears numbering 15-40 and up to 80 in the late summer and fall. As a result, Kaktovik is becoming more and more popular with tourists from all over the world coming to see the polar bears. The bears primarily stay on the barrier islands just outside of town, but there is a great potential for human-bear conflict, and the DZS is interested in seeing how Kaktovik handles the conflict. Usually, the bears are kept away with all-terrain vehicles (ATVs) and trucks, but sometimes more force is necessary. Shotguns loaded with “cracker shells” or bean bags are then used to keep the bears away. An important safety measure that has been established is the Polar Bear Patrol. This patrol drives around Kaktovik every night from 8 p.m. to 8 a.m. protecting the community from bears wandering into town. This year, there was more whale meat at the bone pile than last year, so bears seemed to stay near the pile and away from town. Last year, while I was in Kaktovik, an incident occurred when a bear consumed some dog food from underneath the house next to ours and entered another house to feed on seal blubber. We came to Kaktovik a week earlier than last year hoping to also observe brown bears. Brown bears have also been affected by the warming climate. They are moving farther north and coming into more contact with polar bears, overlapping more in resource use and, in some places, even hybridizing with polar bears. 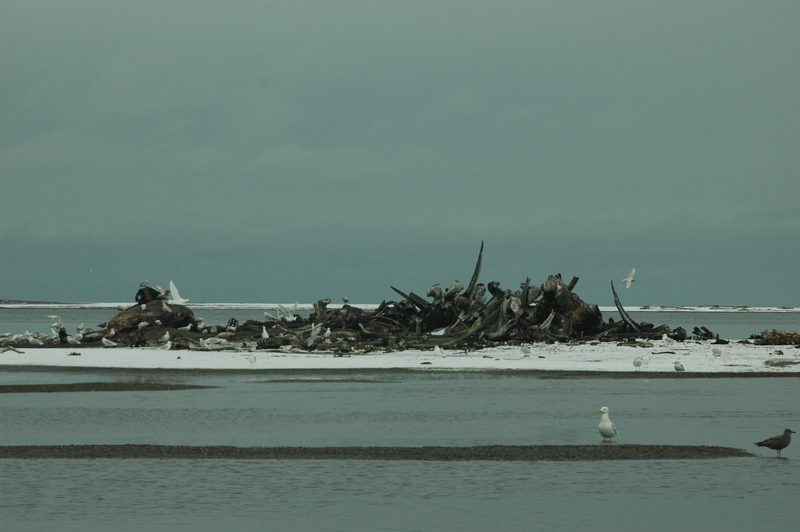 At Kaktovik, both bear species have been observed feeding on the whale remains, and the DZS is interested in better understanding the overlap in resource use between these species. Unfortunately, no brown bears were seen this year during our time in Kaktovik, and locals informed us that only two or three brown bears had been seen this year. Kaktovik is just one of the communities on Alaska’s North Slope that face unique circumstances with our Earth’s changing climate. The increased interaction with polar bears and brown bears is a fascinating situation and will become increasingly important for the management of both species. With continued monitoring of bears on the North Slope, the safety of both the public and the bears will remain the top priority of the community, and the DZS will assist in this effort. – Paul Buzzard, Ph.D., is the director of conservation for the Detroit Zoological Society and Betsie Meister is the associate curator of mammals. 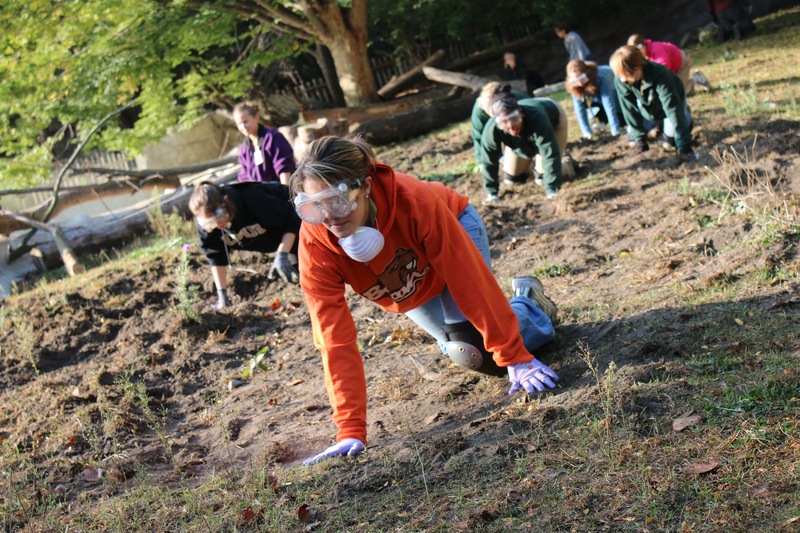 For more than six years, the Detroit Zoological Society’s Berman Academy for Humane Education has led a gardening program with Oakland County Children’s Village that helps to instill reverence and respect for wildlife and wild places with the 12-17-year-old boys residing there. Children’s Village provides a safe, structured environment for youth that includes secure detention, residential treatment and shelter care services. 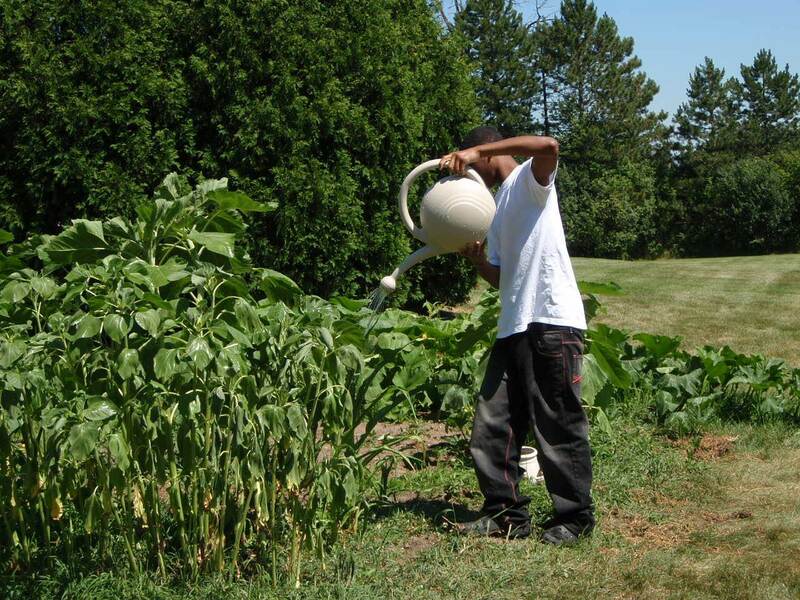 While there are approximately 16 to 20 teens that participate in the garden program at any given time, the resident population changes regularly, so we’ve had the opportunity to work with hundreds of boys through the course of this program. The boys implement the garden from start to finish, and I work right alongside them with Claire Lannoye-Hall, a DZS curator of education. We incorporate a number of projects throughout the year, in addition to cultivating a fruitful harvest. A lot of emphasis is placed on how we can humanely interact with the wildlife that we find in and around the garden, which includes implementing measures that humanely deter wildlife from eating our cherished produce. For example, we’ve built a fence, made wind chimes out of discarded DVDs, and used cayenne pepper flakes to discourage the resident groundhog from nibbling on our plants. The young gardeners learn to avoid some conventional deterrents that are not humane, like predator urines for example, as the urine is often harvested from animals that reside on fur farms in deplorable conditions. While this program mainly takes place in the summer months, we still visit the boys on a regular basis throughout the rest of the year. It’s important for us to have a consistent presence – for the boys to know that they can depend on us showing up. One of our favorite winter projects is making fleece toys for dogs that reside in local shelters. After the boys finish, I deliver the toys and take pictures of the dogs having fun with their new playthings. The boys take great delight in seeing the pictures and knowing they’ve brought some joy to these pups. Another project we’ve done for the past few years is making Valentine’s Day cards for pediatric patients at Children’s Hospital of Michigan, using pressed flowers from our garden. It’s quite heartwarming to see how thoughtful the boys are when crafting their messages and designing the cards. Our projects are often centered around being kind to others, as there’s research that shows when you’re kind to someone else, it helps to foster empathy within. One of our favorite projects is our photography project in which the boys take pictures of the garden and surrounding area. It’s amazing to see them take a picture of a bee resting on a sunflower that they’ve planted from seed or a tiny tree frog climbing on the side of a raised bed that they made with their own hands. There’s a lot of delight and wonder that comes from observing nature from behind the lens of a camera. 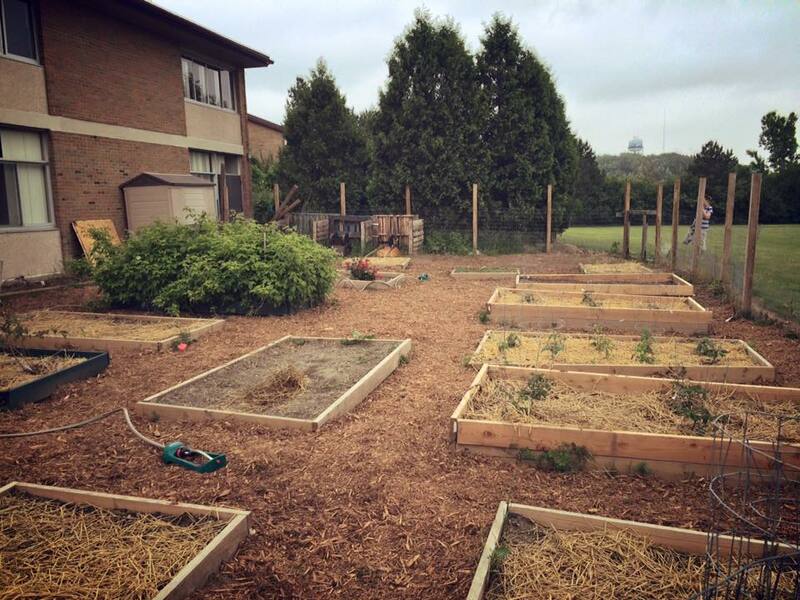 As you can imagine, our garden program is always one of the highlights of my week. I look forward to see how it continues to unfold in years to come. Lisa Forzley is the humane education manager for the Detroit Zoological Society and oversees the Berman Academy for Humane Education. The Detroit Zoological Society (DZS) is gearing up for our ambitious goal of becoming a zero-waste organization by 2020! We are currently performing waste and recycling audits to have a better understanding on where we stand. This process is causing us to re-think our consumption and how we can develop a more closed-loop approach, which means that zero waste is created. One major challenge we will have here at the Detroit Zoo is trying to get our 1.3 million visitors on board with this effort. There’s no better way to do that than to share the new five “R’s”, which is the brainchild of Zero Waste Home. REFUSE – Start by evaluating the items you consume and if they are truly needed – things like bottled water, plastic bags, and paper towels/napkins at home. REDUCE – Purchase goods only when absolutely necessary. At the Zoo we’re replacing less sustainable lighting with LED lighting, which helps us with energy costs, but also reduces the quantity of light bulbs we use. REUSE – Find a creative second life for as many items as possible, even if it’s something that is easy to recycle. It’s always better to reuse a product first – Pinterest has a treasure-trove of ideas for upcycling, many of which are fun for kids. RECYCLE – Always recycle plastic, metal, paper and glass. If you don’t have a curbside option, the state of Michigan has a resource for drop-off locations near you. In addition, recycling and donation bins are popping up all across the state for clothing, books, and even electronics recycling. ROT – Ask your neighborhood recycler if they have composting available or start a compost pile in your backyard. One extra “R” developed by the DZS Greenprint is REPLENISH — find ways to give back. This could involve anything from joining an adopt-a-beach program or volunteering to help an environmental nonprofit. You can also donate to the Detroit Zoological Society to support our mission of Celebrating and Saving Wildlife. Join us on our Green journey! This year, the Detroit Zoological Society (DZS) celebrated its 13th year of strategic planning around green efforts. Lucky 13 has proven to be our year, as we’ve just been awarded the 2015 Green Award – top honors – by the Association of Zoos & Aquariums for our sustainability initiatives. This national award recognizes that being green also makes good business practice and directly contributes to the conservation of the natural world. This honor came on the heels of the DZS completing our bottled water phase-out effort, which is helping to keep more than 60,000 single-use plastic bottles out of landfills and the environment. Over the last three years, the DZS has also invested more than $3 million into energy efficiency projects, which results in utility costs savings of nearly $275,000 annually. The year ahead is even more exciting as we are currently breaking ground to build the first dry biodigester in Michigan, and the first zoo-based system in the country. 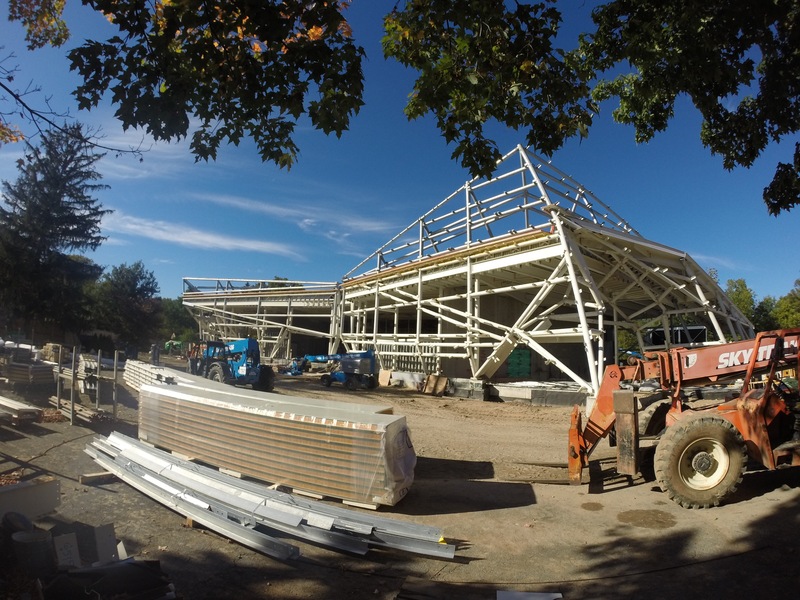 This biodigester will compost more than 400 tons of animal waste and organic food waste while capturing methane to be used as a renewable energy source to help power the Zoo’s animal hospital. We are also getting our feet wet (or in this case keeping them dry) with permeable pavement sidewalks and parking lots, which diverts storm water from our sewer systems to prevent flooding and sewer overflows into our rivers and lakes. And perhaps most exciting, we will open the new Polk Penguin Conservation Center in early 2016, which will represent our most sustainable construction work to date and will provide more than 80 penguins of four species with a state-of-the-art habitat while creating a critical discussion around climate change. The entire building is being designed to meet goals of LEED and components of the Living Building Challenge, with renewable and recycled materials, daylight harvesting through solar tubes, as well as water filtration systems helping us reach net-zero water use. 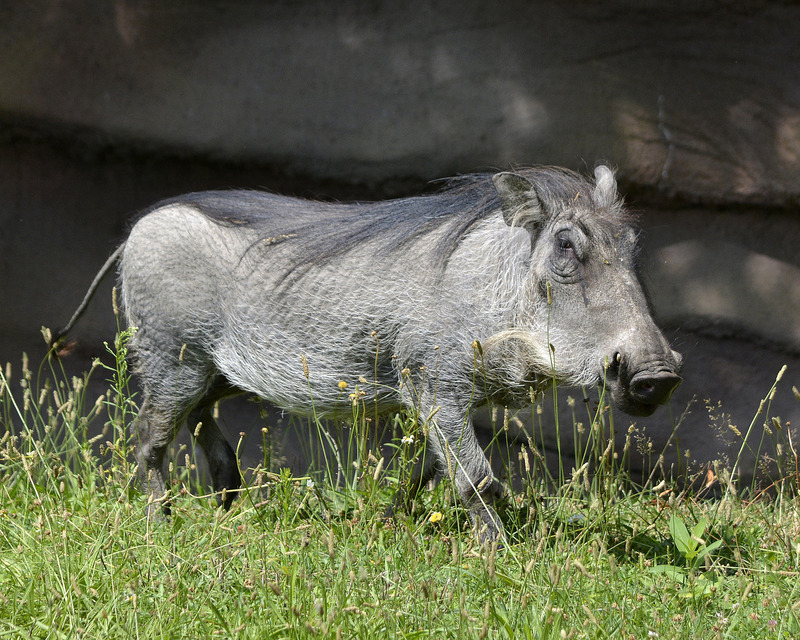 Animal Welfare: What is a Warthog Thinking? The Detroit Zoological Society’s Center for Zoo Animal Welfare (CZAW) has been hosting workshops to train other professionals around the world to assess and improve animal welfare each year since 2012. In that time, more than 50 people have come to the Detroit Zoo to learn more about the ways in which animals are impacted by living in captive settings, and how to address the challenges they face. This year is no different. Another class is here spending five days with us and participating in lectures, discussions, group projects and exercises in the Zoo. One of the most fun and impactful activities might sound a little silly. We ask the participants to walk around the warthog habitat, first as a human, then as a “warthog”! Every species – and really every individual –experiences the world in different ways. When they are being warthogs, the participants crawl around while wearing goggles that occlude their vision. This is to simulate what it might be like for a warthog living in the habitat, as they rely less on vision than humans do, and to allow each person to get a better sense of how different the world is from the perspective of another species. Once we start to ask ourselves how the animals experience the world we have created for them, we can truly begin to understand what is working for them and what may need to be improved. One of the goals of CZAW is to provide animal welfare training, and although it is a whirlwind of activity, it is incredibly rewarding for our staff. Not only do we get to meet others who have the same desire to improve the welfare of the animals for which they care, but we get to play a part in helping them to make animal welfare a priority at their own institutions. Dr. Stephanie Allard is the director of animal welfare for the Detroit Zoological Society and oversees the Center for Zoo Animal Welfare.